Merlin cheers things up with his mischief. Emily Steenhout taught her cat Merlin (formerly named Dayton) to sit and extend his paw for a treat. Anyone who has had a cat knows that teaching one to do tricks can be a daunting experience, but Merlin has a prime motivator: food. “It’s his favorite thing. He can’t get enough of it,” Steenhout says. 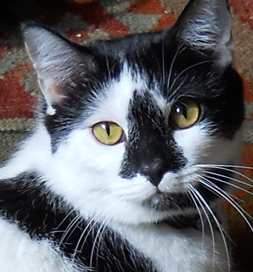 Merlin was a stray before Homeward Trails Animal Rescue in Arlington, VA, rescued him. Steenhout spotted him on Petfinder while browsing for adoptable cats online. During the day he’s a bird watcher who perches in the kitchen window. He also enjoys playing tag or romping with Shiloh. And then he enjoys a nap in his own cozy bed. “Dayton’s other favorite past time is to be in the kitchen while I am cooking and to meow, begging to be given some of the food,” Steenhout says. Did we say that food was his biggest motivator?